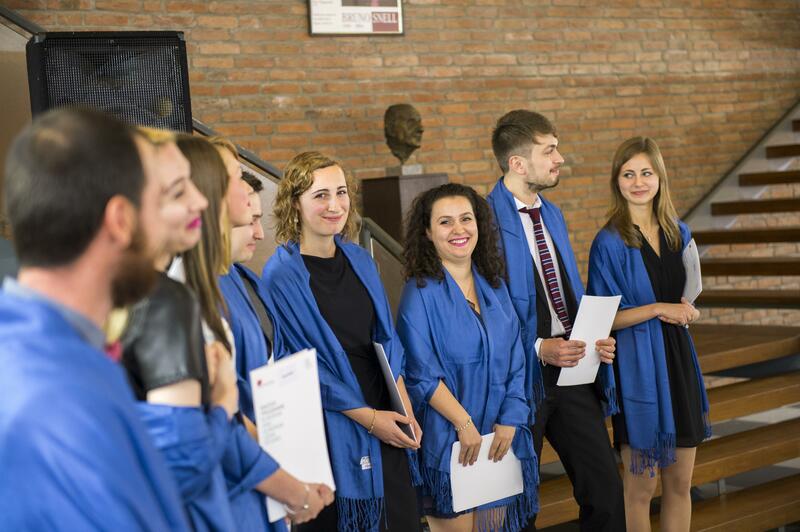 On Friday, October 30th the graduating class 2015 of the Master Programme European and European Legal Studies were awarded their degrees in a festive ceremony at Europa-Kolleg Hamburg. On the same occasion the incoming student of this year`s study course were welcomed by Dr. Dr. H.c. Jürgen Lüthje, President of the Europa-Kolleg Hamburg and Prof. Dr. Markus Kotzur, Director of Studies. In his commemorative speech, Prof. Dr. Jörn Axel Kämmerer from the Bucerius Law School pleaded to keep faith in a common future for the European Union in spite of current challenges. Alluding to the numerous achievements of the EU in the last six decades, Prof. Kämmerer emphasized not only the economic challenges we currently face, but also the ideational ones: without a common European identity it might turn out to be tough developing a transnational solidarity. Consisting of 17 students from 15 countries, the programme’s international character is evident. Among the new class of students is Sahar Raza, who fled her home country Afghanistan and arrived in Hamburg less than a year ago. It was an initiative of the Europa-Kolleg Hamburg to give a qualified refugee the opportunity to pursue a Master’s degree in European and European Legal Studies and with the help of the Hamburg Refugee Center viable candidates were identified and Ms. Raza was chosen and awarded a tuition stipend by the Foundation Europa-Kolleg Hamburg.